The key difference between this 2nd tier model and the top end L7200 is the Clear Scan 120Hz feature as opposed to the 240Hz in the L7200. Aside from this difference, it has all of Toshiba's top end 2012 features such as LED edge lighting and passive 3D compatibility, Toshiba's Smart TV suite, the new CQ Video Engine (dual core) and passive 2D to 3D conversion. It also has a full web browser and QWERTY keyboard. This model comes available in April or May of 2012 and will continue until March of 2013. Toshiba's edge lit 47L6200U has a good bit of judder effects when panning side to side or during fast motion. We recommend leaving the 120Hz anti-judder feature on for this TV as it does not produce too much "soap opera" effect when left on as many other televisions do. This is a result of taking out natural background blur. For sports programming the feature improves the picture considerable – especially with HD sports. Though the screen on the L6200U is more of a clear coat which we like it still exhibits some weak side angle viewing characteristics. Contrast and color saturation decrease starting at 20 degrees off center. This is one of the weaknesses of this TV. Toshiba is very proud of their passive 3D Viewing Quality and what is nice is that there is no flicker from the 3D glasses from any internal room light. The 3D picture still looks deep and involving even though it is not active 3D. 2D to 3D conversion is much better this year and is worth trying from time to time. Effects are more muted than normal 3D content, but do provide a better option to 2D than in the past. Toshiba's Passive 3D Glasses cost a fraction of active 3D glasses and are very light. We recommend giving the Dynalight sensor mode a pass. 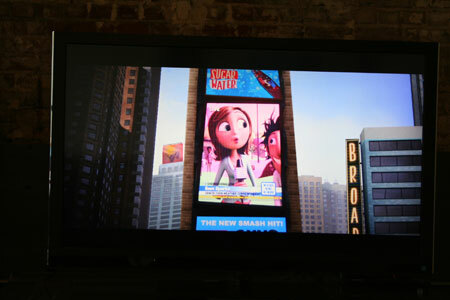 This mode automatically adjusts the backlight intensity depending upon room and content, but it adds slight flicker to the picture. The 47L6200U includes built in Wifi and a web browser for easy access to the Internet. Navigation is better as well due to a full QWERTY keyboard remote control with a typing pad. I can attest to how slow trying to use the 5-way controller on a remote is when attempting to enter keyword serch terms. The keyboard solution is welcomed. An additional features, the eportal web browser is new for 2012 and allows Tablet and Smart Phone control apps to control the L6200. The beautiful nearly frameless look is in for a reason this year. It's great looking. 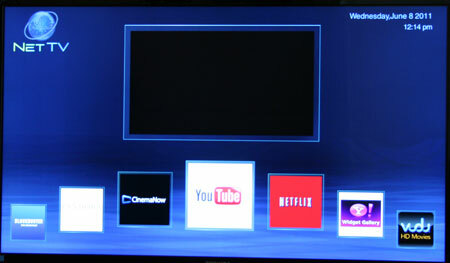 Toshiba does a great job with the design on this TV similar to the top end Samsung's and Cinema Screen LG TVs in looks. Depth is just 1.7” total counting speakers. "With the invisible speakers in flat-screen televisions, Audyssey technologies really kick in to give you quality audio you didn't know was possible. Our equalization technologies balance speaker levels, then bass and volume extension technologies push the speaker drivers give you fuller and louder sound. When you need to turn down the volume, our volume technologies preserve the bass and adjust volume variances so dialog stays loud and clear. With Audyssey's heritage in home theater and decades of experience collaborating with manufactures on acoustic software technology and hardware design, we give you a best-in-class audio experience for your movies and music." A new HD PC input accompanies 4 HDMI inputs and a component input option as well. 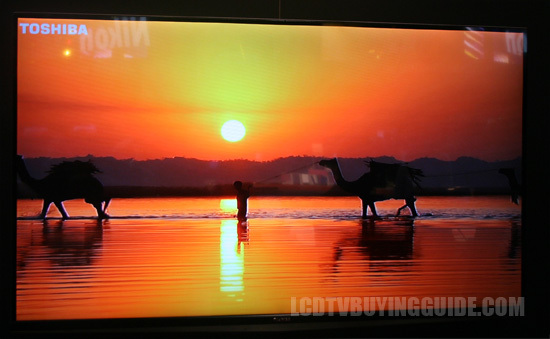 Priced at $1400 or so there is lots of competition in the 46 and 47 inch size LCD TVs. This Toshiba is feature loaded and compares with the Sony KDL-46HX750, the LG 47LM6700, and the Samsung UN46ES7100 series. As such I would give it a satisfactory value rating as it comes in at a comparable price to those TVs. Of course, the passive 3D glasses do make the Toshiba a bit more competitive than the Samsung or Sony.